Today’s parents make hundreds of decisions for their little ones with a combination of instinct, friends’ advice, and research. Even with the recent surge in sales of new types of cloth diapers, many parents remain unaware of the latest developments in cloth. Curious moms are going to the Internet to research, but basic information is still somewhat hard to find. There have always been economic and environmental advantages to using cloth diapers. Clearly, having diapers that can be washed and used again saves (a lot of) money and keeps disposable diapers from filling up landfills. Even the most expensive and fancy cloth diapering system will save the average family $1,000 or more over disposables. Unfortunately, many moms today still envision cloth diapering as squares of cotton, safety pins (eek!) and plastic pants. The closest thing to traditional cloth diapering of all the modern diapers. The Wrap (also called a “Cover”) is waterproof, typically PUL (Polyester Urethane Laminate) fabric with elastic edges. Some Wraps put the PUL between layers of cotton for a very soft feel. The Wrap usually closes with Velcro® or snaps so you can adjust fit. Absorbent layers – which could be cotton, hemp, bamboo, or microfiber – are placed inside the wrap to hold liquid. Some moms attach the absorbent layers with a Snappi closure. A “prefold” just refers to the old kind of diaper with thickness down the center. Several manufacturers make squares (“Prefolds” or “Flats”) that you fold in thirds to use inside a Wrap. Prefolds and Flats can be a variety of materials. Cotton and hemp are popular. At changing time, some moms will just switch the absorbent layers and re-use the Wrap/Cover if the baby is only a little wet. Pros: Cheap – the least expensive of cloth diaper styles. Flexible – Moms can adjust absorbency by adding more layers. Cons: Putting them together requires extra time, effort. This diapering method is similar to the “Wrap with Prefolds” approach except it has a fitted absorbent layer. Several manufacturers make fitted diapers in cotton, bamboo, and other natural fiber blends. The absorbent fitted diaper may have Velcro® or snaps to close, and the wrap goes over it to form a moisture barrier. Pros: Better absorbency and comfort than “Wrap with Prefolds”. Cons: Sort of like putting 2 diapers on, need to buy more sizes, longer drying times than flats. Pocket diapers are made with an outer PUL waterproof layer, inside wicking layer, and “stuffed” with washable absorbent pads (called soakers, doublers, boosters) from an opening in (usually the back edge of) the diaper. It is the most common design because it can be loaded up with absorbent layers that stay relatively in place. There is typically a soft interior material, which gives the baby healthier skin and a dryer feel. 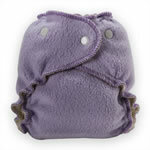 Pocket diapers are often “one-size” designs that can be adjusted to fit babies of different sizes. Pros: Selection – Many options with snaps, Velcro, different soakers. Adjustability – fits a wide variety of infants. Absorbency can be adjusted by stuffing in extra soakers. Cons: Requires disassembly before and re-stuffing after washing. Some fleece insides may stain. One-size designs can be bulky at the small settings and may not fit up to potty training age. These diapers are usually all one piece but sometimes have a snap in soaker, making it an “all-in-two”. The easiest type to use, they require little or no assembly and, like all cloth diapers, can be washed in a regular home washing machine. Outer layer is waterproof and typically PUL polyester or nylon fabric and the inside usually includes a multi-layer microfiber (also called microterry) or cotton soaker for absorbency. Some AIO/AI2 diapers come in sizes, and other are adjustable “one-size” designs. Pros: Simple – Very easy to use, no stuffing/assembly needed. Cons: Often require longer drying times, may not have enough built-in absorbency. Doubler: A doubler looks like a pad and is an absorbent soaker that can be added to a cloth diaper if you are having leakage problems or for times when extra protection may be needed such as overnight. It “doubles” the absorbency of the original soaker, hence the name. Booster: Like a doubler (above), but lighter-duty. Boosters “boost” the absorbency of a soaker, hence the name. Liner: This is a super-thin (paper-like) layer that some moms like to put on top, inside their cloth diapers. Liners are disposable or flushable and usually come on a roll. Liquids flow through to the diaper as usual, but liners keep the poop from staining or sticking – you can flush or throw them away at each diaper change. Snappi: A special “T” or “Y” shaped plastic closure to secure fitteds or contours (like a fitted with no elastic or closure) on the baby (replaces diaper pins). Snappis are not needed for Pocket or All-in-One/Two diaper styles. One-size vs. Sized/Fitted: Some diapers have adjustability built-in, others come in sizes. Usually you sacrifice some comfort at the high and low end of the size range for “One-size” diapers. Sized diapers will give the best fit, but you will need to buy more as your baby grows. Check out our Cloth Diaper Comparison chart to see how a size “medium” fitted diaper compares to “one-size” diapers in a few of the top diaper lines. Wet Bag: Many moms like to have these washable, waterproof fabric zipper bags for dirty diapers. You can also just stash some plastic grocery bags in your diaper bag to bring home dirties. Wet Bags come in a variety of sizes and large ones are nice to have near your changing area to hold the day’s diaper laundry. PUL: Polyester Urethane Laminate (PUL) is used as a waterproof outer (or layer) fabric for many Wraps, Pocket, and All-in-One/Two diapers. 100% Polyester interlock is laminated (could be 1-2 mil thickness) on one side and becomes waterproof but remains breathable. Good quality PUL can withstand very high temperatures and should last for 100s of washings. Note: we have heard both P.U.L. and “pull” as pronociations. Microfiber/Microterry: Microterry fiber is a low-lint, soft fiber that is ideal for use as a cloth diaper soaker, doubler or booster. It is the most common fabric used for Pocket diaper soakers. Good quality microfiber has a velvety feel and typically contains 80% polyester and 20% polyamide fibers. Microfiber is 3-4 times as absorbent as cotton for the same bulk and will dry faster. Suedecloth: Used as a lining in many pocket and All-in-One/Two diapers, suedecloth is typically 100% polyester woven material that has a soft feel. 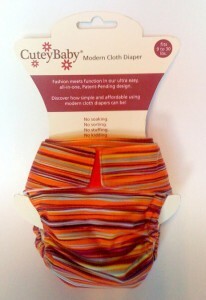 It resists staining and wicks away moisture to the inside of the diaper. The fabric will not hold moisture making cleanup a breeze and keeping baby’s skin drier than cotton. Microfleece / Microchamois: Thin, soft fleece is used as a lining in some pocket diapers. This is usually 100% polyester or sometimes recycled plastic fiber content. Microfleece and microchamois (pronounced micro-shammy) have a soft feel against the skin and pull moisture in to the soaking layers. They do stain more easily than other lining fabrics. Cotton: Our old friend cotton still plays a big role in diapering. Organic cotton is a popular soaker/inside material and is used for fitted and contour diapers (that require a cover). Cotton is very slow to dry and may require up to 8 washes before it reaches full absorbency. Organic cotton is grown without chemical pesticides, which costs more, but is kinder to the environment. However, organic and “regular” cotton perform the same in diapering. Hemp (fleece, terry): Hemp is stronger, more absorbent, and more durable than cotton and most other fabrics. Hemp on its own is not soft enough for baby’s skin, so most hemp fabrics are 55% hemp with 45% cotton. Hemp also carries natural antibacterial properties. Hemp requires several hot washes to reach full absorbency (called prepping), and it will shrink A LOT – usually in one direction. Hemp absorbs like crazy and many moms swear by hemp Doublers/Boosters (see above) for night time cloth diapering. Bamboo (fleece, velour): Bamboo has a silky texture and is very absorbent. It is a naturally antibacterial fiber that will not lose its softness after countless washes. Bamboo fleece and velour are used in fitted diapers and as interior diaper fabrics. Along with hemp, bamboo is kind to the environment due to it being easily renewable and bug-resistant. Bamboo and hemp are still quite expensive fabrics, and that will show in the price of diapers that use them. Wool: Many experienced cloth diapering moms swear by wool outer layers. Wool requires some special care to keep its water resistance, and I wouldn’t recommend it for a mom who is trying out cloth diapering for the first time. However, if you are really dedicated to using natural fibers, this is the only one with built-in moisture resisting qualities. Modern diapers do NOT get soaked in an icky pail of wet stuff! Thank goodness!! Most cloth diapers will have the instruction: “shake off solids” and then wash in hot water with 1/3 the normal amount of liquid detergent. If you are new to cloth diapering, I recommend getting some disposable/flushable liners with your first purchase. If you line the diapers, then you just lift off the little liner thing and trash or flush it. If no liner, then you sort of shake poops out into the toilet. Some moms like to have their dirty diaper bin in the bathroom. So at changing time they take off the dirty dipe, set it aside, put on fresh diaper – then walk into the bathroom & shake out / flush, leaving the dirties in a container or laundry bag in the bathroom. Other moms (myself included) have two bins by the changing table – one for trash (shake out or put liner in there) and one for the diaper laundry. You can wash every 1-3 days, depending on preference, and how many diapers you have. Lots of cloth diapering moms (myself included) started out just wanting to cut down on trash & expenses and were willing to “test drive” cloth for part-time use. If you want to try cloth diapering, pick the type of diaper that suits you best and buy enough for one day’s use (usually 6-10 diapers or 4-6 wraps plus prefold/fitted). Maybe pick two brands and buy a few of each so you can see what you like best. Once you see that it’s “no big deal” you can expand your collection – or “stash” of diapers, as we say. If you don’t like it, there are several sites where people buy pre-owned diapers in good condition. Simply take a quick photo, post your items for sale on Diaper Swappers or eBay, and make your graceful exit from cloth. Note: If you have a cloth diaper retailer near you, DO go to a specialty shop. The people there can be extremely helpful and will answer any questions you have about the different types of cloth diapers. Cloth diapering is something that you can do part-time, or whenever it works best for you. While I was cloth diapering 90% of the time, I still grabbed a disposable every once in a while and kept a pack on hand for emergencies (or my Mother-in-law). The important thing is to do what works best for you. Cloth diapering can be very easy – and cute (wait ’til you see some of the prints!). For an extra load of wash here and there, you can save thousands of dollars on diapers AND reduce the amount of trash you generate. What a nice thing for your baby’s future!